Statecraft, or the art of conducting a state's affairs with other states, is as old as human civilization. So too is diplomacy, the form statecraft takes in time of peace. 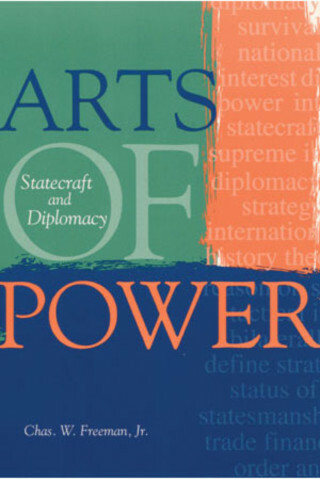 In this comprehensive treatment, distinguished diplomat Chas Freeman describes the fundamental principles of the art of statecraft and the craft of diplomacy. The book draws on the author's years of experience as a practicing diplomat but also his extensive reading of the histories of ancient India, China, Greece, Rome, Byzantium, and the Islamic world as well as modern Europe, Asia, and the Americas. Among numerous other subjects, the book addresses the role of intelligence, political actions, cultural influence, economic measures, and military power, as well as diplomatic strategy and tactics, negotiation, and the tasks and skills of diplomacy. Chas. W. Freeman, Jr., has been a career officer in the U.S. Foreign Service, ambassador to Saudi Arabia during the Persian Gulf War, and assistant secretary of defense for international security affairs. He was a fellow at the United States Institute of Peace in 1994-95 and is the author of Arts of Power: Statecraft and Diplomacy (USIP Press) and Diplomat's Dictionary (USIP Press).